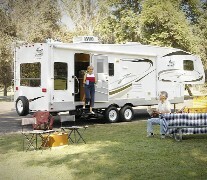 At just under 30' long, this medium height fifth wheel will find easy accomodations in most parks. At the front is the bedroom suite with 60" X 80" queen bed and full side bath (with deluxe window), and wardrobe on opposite of the hall. 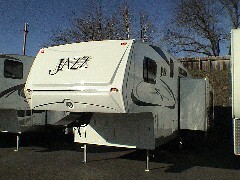 The rear half of the unit is its complete living area Central galley with dinette and refer on the slider. A sofa bed sits across the rear below panoramic surrounding tinted windows with day/night shades. There's a beautiful built in Home Entertainment System visible from all seating. 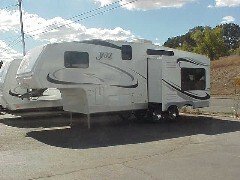 Sleeping for six in this upscale fifth wheel.